Thank you Tom Thumb and Albertson’s for sponsoring this post. Check out the new Signature family of brands from Tom Thumb/Albertson’s, with more than 4,000 Signature products available and a 100% money-back guarantee. It’s BONUS recipe day! Yeah! 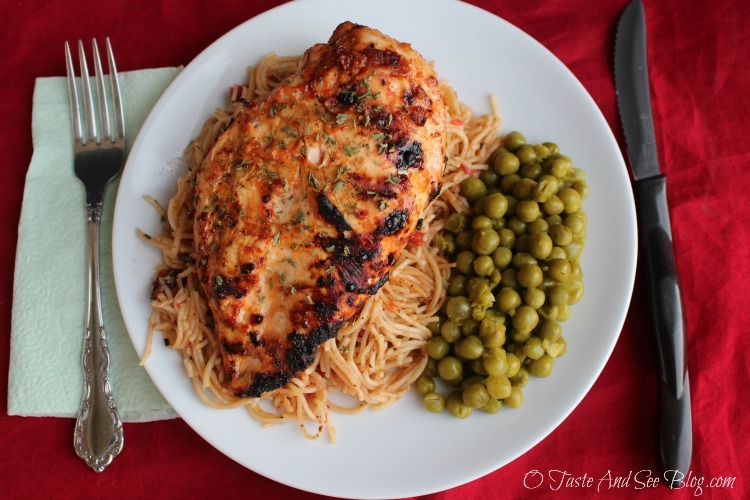 Today, I’m sharing our meal using Signature brand products from Tom Thumb and Albertson’s including Sweet Red Pepper Chicken and Fire Roasted Tomato Pasta and…..
It’s funny how we change as we grow older. When I was a child the thing I loathed most in life was the grocery store! It was torture being dragged there. Now, it’s one of my favorite places…I’m a food nerd, what can I say? Seriously, I love grocery shopping! My daughters (whom I share a car with) often offer to pick things up on their way home from somewhere and I so appreciate their thoughtfulness but sometimes I’m disappointed I don’t get to go myself. What is it about grocery shopping that I love so much? Well, I think partially it’s the shopping but also it’s MY grocery stores I love visiting. My most frequented store is my local Tom Thumb. Before we moved to Texas I’d never heard of them, but it just so happened Tom Thumb was the closest store to my house. Although now, I’d shop there even if I had to drive across town. When I’ve forgotten something and need my husband to pick it up on his way home from work, I always ask him to stop at Albertson’s. I know they will have the same brands as my Tom Thumb and the same sales, plus it’s right near his office. What makes my grocery store so special? Well, several things. First, the folks who work there! They are always SO polite, kind and helpful! They always speak to customers and call them by name when checking out. I’m there A LOT so I know employees in all departments and they know me. Next, the store itself. It’s always neat, clean and well stocked. The things I’m looking for on sale are always very visible. No trying to hide the sale items so you give up and purchase something more expensive. It’s also quiet. I know that may sound silly but I need to focus when I’m shopping and a lot of noise is very distracting to me. Lastly, Signature brand products. Here in Mansfield, Signature products are at Tom Thumb and Albertson’s but they’re available at all the 18 banner stores of the Albertson’s Companies. Maybe your local store would be ACME, Jewel-Osco, Vons or Safeway. I buy everything from juice to coffee, fresh produce to fried chicken (LOVE the fried chicken!) and many pantry staples…there’s over 4,000 items! It’s my favorite way to shop the store I love and save money at the same time. That brings us to our 2 recipes…. Sweet Red Pepper Chicken is a wonderfully flavorful, easy chicken recipe that can be made with boneless chicken or bone-in. I did some of both, since my son loves chicken legs. We grilled the chicken but it could also be baked or “grilled” inside on a griddle or skillet (using a very small amount of oil). Marinating the chicken in Signature Sweet Red Pepper Vinaigrette helps make it tender and juicy giving it an excellent flavor. Don’t let the “pepper” make you shy away. It isn’t spicy, hot or have too much of a bell pepper flavor. With our Sweet Red Pepper Chicken I served Fire Roasted Tomato Pasta. I have to admit, I kinda made this recipe up as I went along. We’re all trying to “cut back” around here (you know getting ready for a wedding and all) so I wanted to serve some pasta with a lighter sauce. Fire roasted tomatoes are my go-to for salsa and Mexican rice but they are wonderful in Italian dishes as well.. The flavor was the perfect complement to the Sweet Red Pepper Chicken. I started with a very small amount of olive oil, just enough to saute a little garlic, added Signature Angel Hair pasta (cooked) then tossed with about half the can of Fire Roasted Tomatoes, with juice. It heated quickly in the skillet and my family LOVED it! 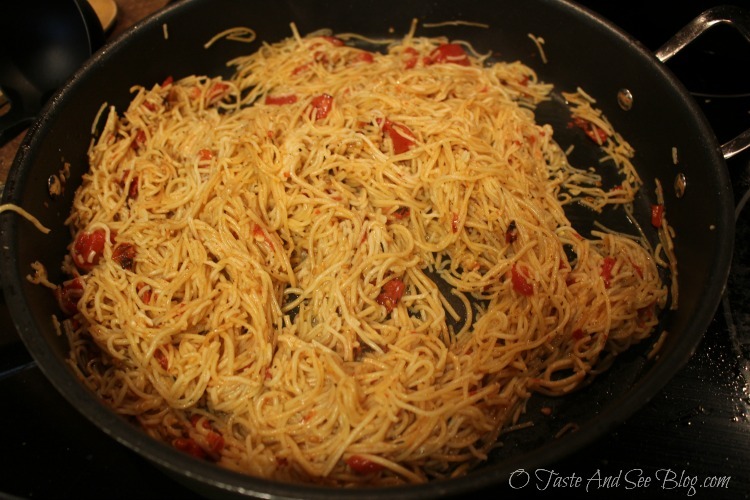 This recipe is also a great way to use up left over spaghetti noodles. I quickly heated a can of Signature Kitchen Sweet Green Peas and it rounded out the meal perfectly. You could also serve with a green salad using the Sweet Red Pepper Vinaigrette dressing. Giveaway begins April 18 and ends May 13. Winner will be contacted by May 20. Easy recipe for flavorful, tender and delicious chicken. Angel Hair pasta in a light flavorful sauce. This recipe is also good using left over noodles. This post is linked up at Family Fun Friday Link party, Let’s Get Real Friday Party, and Weekend Retreat Link Party, Wednesday Roundup, Wake Up Wednesday Link Party, Pin-teresting Link-up, Pretty Pintastic Link Party, Traffic Jam Weekend, Create Link Inspire, and Over the Moon. Your recipe looks so good. I’d love to try the roasted tomatoes and the bread crumbs in your picture. I love super simple delicious recipes. This looks amazing to me and it is so easy to make. Yeah! I’m with ya! Nothing like a good simple recipe that everybody loves. Thanks for stopping by and have a blessed weekend!